You, probably. take for granted how your direction arrow and Enter keys behave in Access. When you press Enter the focus moves to the next field and the contents of the field are selected. Likewise, when you press the direction arrow keys, the focus moves to the next field in the appropriate direction. You aren't locked into these behaviors. If you'd like, you can set up the arrow keys to move from one character to the next in the current field, rather than moving focus to the next field. You can also configure the Enter key to move to the next record when it's pressed or configure it to do nothing at all. To modify these settings, choose Tools>Options from the menu bar and click on the Keyboard tab. Then, simply make the selections you want and click OK. In 2007 it's under Access Options>Advanced when you click the Logo in the upper left corner. When you type an entry in a combobox control Access will typically attempt to complete the entry based on the control's lookup list. This is controlled by the AutoExpand property, which is set to Yes (-1) by default. Although such behavior is helpful, it can cause problems if your value list contains several items that are close in spelling, since it's easy for users to accidentally let Access choose the wrong item. 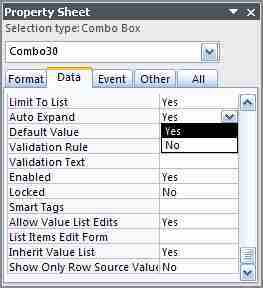 You can avoid errors by setting the control's AutoExpand property to No (0) in Design view or using VBA to set the property equal to 0. Once you've made the change users are forced to type the entire entry or select an item using the combobox control's dropdown list. 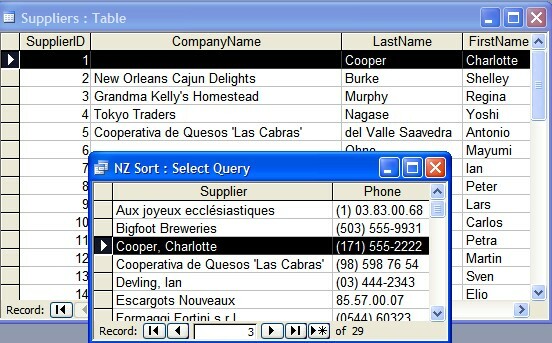 Highlight a Table in the Objects Table view. Go to the main menu bar and click on Insert. Click on it and Access will create a data entry form based on the selected table. When you close the AutoForm, you will be asked if you want to save changes. You can change Access's default form. Create your template form by specifying all the properties you want to maintain from form to form. Then, save the form using any name. Next, select Tools>Options from the menu bar and select the Forms/Reports tab. Enter your template's name in the Form Template box to replace the Access default (Normal) and click OK. The next time you create a form, Access will base it on your form template rather than the typical Normal template. In Access 2007, click the Office button in the upper left corner and the click Access Options. The design options are located under Object Designers: Forms/Reports. The same thing can be done with Reports. Here is one way to provide your users with a means to reorder fields in forms. "Chris Weber develops a solution that allows users to sort the data in their forms (or subforms) that you can add to your application easily. The sorting interface should be generic to any form in any database. It should also work with subforms. It needs to be implemented as expediently as possible to fulfill the bid, and be easily maintained in the future. It should be intuitive or reminiscent of other interfaces in Access and Windows. Scroll down to the bottom of the page. There is a file that can be downloaded with the code. Let's say you have a database that has the company name and a contacts name. In some cases the CompanyName field is empty. If that happens, you want to continue the alpha sort using the contact's LastName. 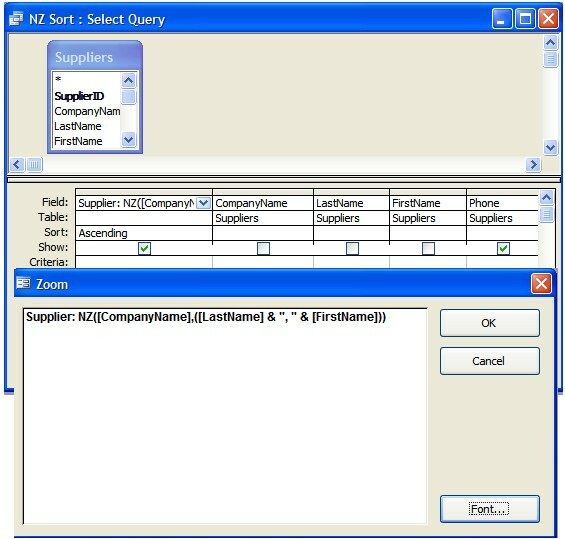 To do this, you need to create an extra query field to provide the sort, using the NZ() function to replace the contents of one field for null values in another. Select the Queries, and then click "Create query in Design view". Choose the table you want to sort, click Add. Drag down all the fields you want to display in your form, including the two separate fields you want to alphabetize. Insert a new column on the left side of the QBE grid. Select Ascending for the Sort option. When you run the query, if CompanyName is null (empty — no entry), the NZ() function uses the contents in LastName instead. It can be difficult to tell which text box on a form you're currently working with. One solution is to highlight the current position, with a different background. Access 2000+ allows you to do this with conditional formatting, but you can also get a similar result using code. Save and close the Module, then open the appropriate Form in Design view. Click the Code button and insert =Highlight("GotFocus") in each of the Form's textbox control's GotFocus event procedure. Likewise, add =Highlight("LostFocus)") to each textbox's LostFocus event procedure. When you've finished, save the changes, close the VBE, and switch to Form view. When you tab to a field, it's shaded yellow. When you tab away from the field, its background is restored to white. "An example might be fax numbers in a customer database. If you store a Null, it means you don't know whether the customer has a fax number. If you store a zero-length string, you know the customer has no fax number. Access gives you the flexibility to deal with both types of 'empty' values." Digit (0 through 9 entry required; plus [+] and minus [-] signs not allowed). Digit or space (entry not required; plus and minus signs not allowed). Digit or space (entry not required; blank positions converted to spaces, plus and minus signs allowed). Letter (A through Z, entry required). Letter (A through Z, entry not required). Letter or digit (entry required). Letter or digit (entry not required). Any character or a space (entry required). Any character or a space (entry not required). Decimal placeholder and thousands, date, and time separators. Causes all characters that follow to be converted to lowercase. Causes all characters that follow to be converted to uppercase. Causes the input mask to display from right to left, rather than from left to right. Characters typed into the mask always fill it from left to right. You can include the exclamation point anywhere in the input mask. Causes the character that follows to be displayed as a literal character. Used to display any of the characters listed in this table as literal characters. You can also enclose any literal string in double quotation marks. Setting the InputMask property to the word Password creates a password entry text box. Any character typed in the text box is stored as the character but is displayed as an asterisk (*). "The value you entered isn't appropriate for the input mask '!\(999") "000\-0000;;_' specified for this field"
You can easily set up a text box to mask entries with asterisks, allowing you to hide entries like passwords from prying eyes. To do so, in Design view, display the properties for the text box and change the Input Mask property to Password. Conditional formatting, in Access, has one more alternative than Excel. Besides "Field Value Is" and "Expression Is", there is "Field Has Focus". You can call attention to the location of the insertion point. In Design View, in the Detail section, click the Control box. Under Condition 1, chooseField Has Focus in the first box. Click the arrow next to the Font/Fore Color button, click the yellow box, and then click OK.
On the View menu, click Datasheet View to view the results. Here is a description about how to perform three different actions on forms to respond to data entries or changes in events. One of the most visually dramatic changes that you can make to a form involves changing the image that tiles across the background of a form. Since the inception of Access, form designers have been plagued by the ability of users to change the size and shape of a form. This is because controls on a form maintain their size and anchor their position to the form's top and left borders even while a form changes its size, shape, or both. Whenever a user changes the size or shape of a form, the form's Resize event fires. You can change the formatting whenever the user moves to a new record in the record source for a form. You can change formatting when a form initially loads data for display. However, the Current event doesn't fire when a user changes a value on the current row, so you can't use this event to respond to user input. To respond to user-entered data, you can use the AfterUpdate event for a control to change the formatting for the value in a control after updating. While the Current event applies to a form overall, you can create an AfterUpdate event procedure for a whole form or a specific control on a form." Look for a demo file called "502DOBSON.ZIP"
This download provides an Access database and a PowerPoint slide show. "Create a PowerPoint slide presentation from scratch using Access data. 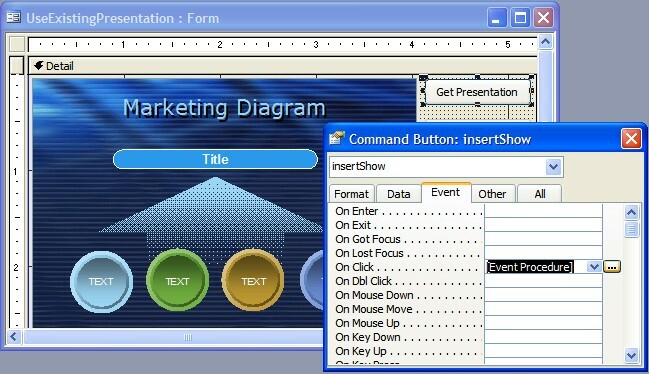 In addition, display and control a slide show from within an Access form. 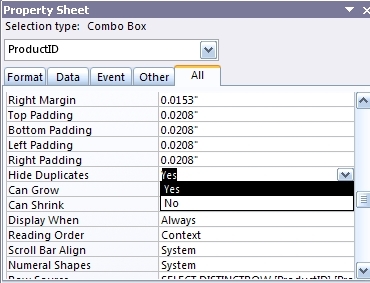 Walk through the solution and explore ways to extend the sample for your own applications. This article looks at two ways of interaction between Access and PowerPoint. 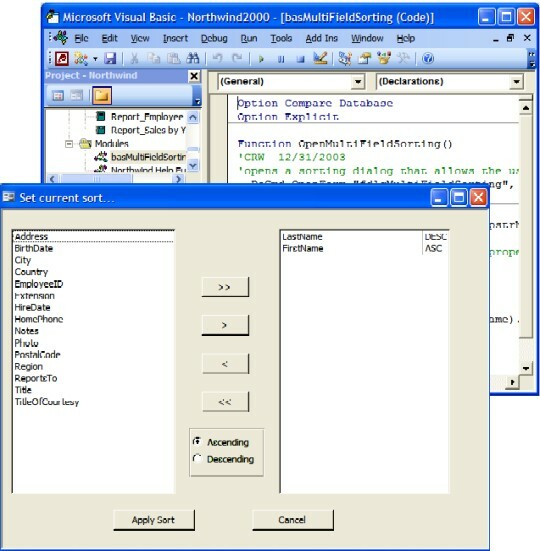 The first sample illustrates how to create a PowerPoint presentation from the data in an Access table using Automation. The second sample shows how to display and manipulate an existing PowerPoint presentation inside of an Access form, also using Automation." If you have some knowledge of VBA, you can probably figure it out from the code on the Access Form. "How to open a report based on a multiple selection in a list box. For example, you may have a list of makes of car and a report that shows various details for each make of car. You want to allow the users to select a range of cars and pull up the report according to that selection." If you have a mix of Canadian and US postal codes, you might play with the following code inserted as a Country control "After Update" Event property. As a rule, if you won't be performing numeric calculations on the data, entries should be stored as text. Social Security numbers, Phone numbers and postal codes should be stored as text. You can use alphabetic characters in an input mask. For example, one of the sample input masks is >L0L\ 0L0 used to represent a Canadian postal code. The ">" character in the input mask converts all the characters that follow to uppercase. The "L" character requires an alpha entry; the "0" (zero) requires a numeric entry. A "\"character causes the following character to be displayed as a literal character rather than a mask character. A space appears between the three character pairs. For example, V5P 2G1 is one valid postal code that the user could enter. The mask would prevent the user from entering two sequential alphabetic characters or numbers. You can manipulate postal codes in Access by changing the data type, input mask, or format of a postal code field. ACC2000: How to Manipulate ZIP Codes in Microsoft Access. In Access, tables can be a bother to use for data entry. Constructing a Form can make it easier. "While working with forms, a split form can be a very useful view because you simultaneously get two views of the form that are connected to the same data source. This demo shows you how to create a split form view where you can use the datasheet part of the form to quickly locate a record and the form portion to view or modify the record. 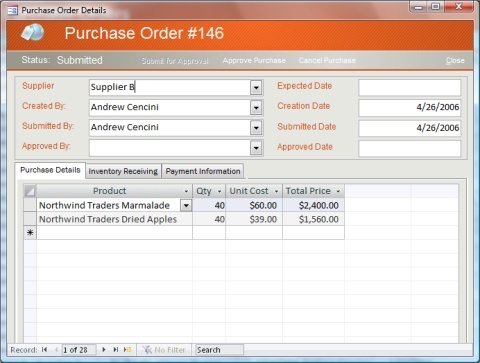 You will also learn how to enhance and customize a split form view to suit your needs." You may want to remove the navigation buttons from an Access form but still display the current record number. Not the ID or serial number, but the record number that would appear in the navigation box. To provide this feature, you can use VBA to place the form's CurrentRecord value in an unbound text box, and then update the value during the Current event. To utilize this property, add an unbound text box to your form in Design view. Then, on the Event tab of the form's Property list, click the ellipsis or Build button. Choose Code Builder. Now, when you navigate from record to record, the MyTextBox control will update automatically to reflect the current number. 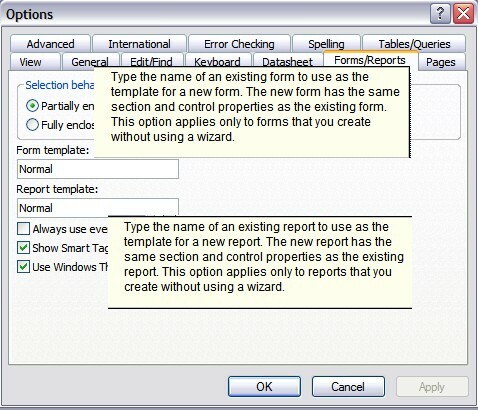 Access 2007 has a wizard that will walk you through the process of sending an information gathering form through Outlook. The wizard is on the External Data tab in the Collect Data group. "You begin with the Collect Data Through E-mail Messages Wizard, which guides you through the steps of creating a form. The form is sent through Microsoft Office Outlook 2007 to your recipients, with your request for new or updated information. When the recipients reply to your message, Access automatically enters their data into your database. When you switch between Design and Form views, the size of the form is dictated by the size of the Design view window, not the size of the form sections. You often need to expand the window to be able to see the rulers and scroll bars in addition to all of the sections. This means you're left with wasted space when viewing the form in Form view, assuming that you forget to shrink the window back down. A solution to this annoyance is to use the Size To Fit Form feature. Simply view the form in Form view and choose Window>Size To Fit Form from the menu bar. If your view of the form is maximized, the menu option will be unavailable and you'll need to click the Restore Window button on the form window to enable the choice. Once Access has resized the form, you can save its current dimensions by clicking the Save button. 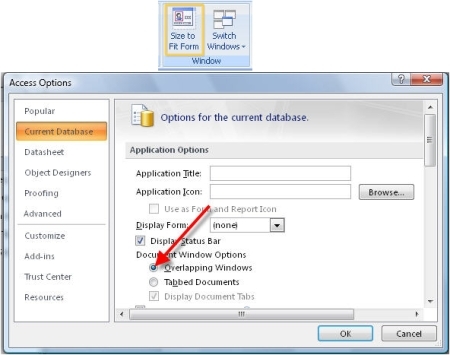 With Access 2007 go to the Office button, choose Access Options and click Overlapping Windows. The Size To Fit Form icon will appear on the Home tab. The Snap To Grid feature is an invaluable tool for aligning controls when you're designing forms and reports. However, when you fine-tune the placement of some controls, you'll probably want to move some of them to positions that aren't exactly aligned with the design grid. You can temporarily disable the Snap To Grid feature by holding down the [Ctrl] key. Then, you can use your mouse or the cursor arrows to place the controls exactly where you want them.